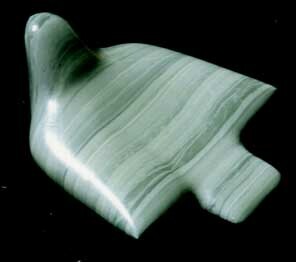 This stone is "light jade" in color. (A painter would add a little blue to the green to achieve the exact hue.) It has a distinctive, wavy banding -- of alternating light and dark greens. This banding tells the geologist that the stone was formed as layers of deposition in a marine environment. Its wavy pattern suggests that the water was turbid. Structural geologists call this rock "turbidite." It has a curious and distinctive manner of breaking. To one sculptor, it breaks "like chocolate," to another, its cleavage pattern "suggests the mesas, arroyos, and other erosional elements of a southwestern desert." Some sculptors like to utilize its attractive broken edges in their work. One Duck Greenstone is harder than marble, but softer than granite. It should be worked by grinding, not chipping. Not for amateurs, gluing is often required. Not a calcium carbonate like marble or limestone, One Duck Greenstone will not deteriorate in the outdoors. Its polish will be long lasting. This stone comes from the One Duck Lake area of Prince of Wales Island.